Bundaberg Airport (also known as Bundaberg Regional Airport) is a regional aerodrome serving the city of Bundaberg and surrounding area. 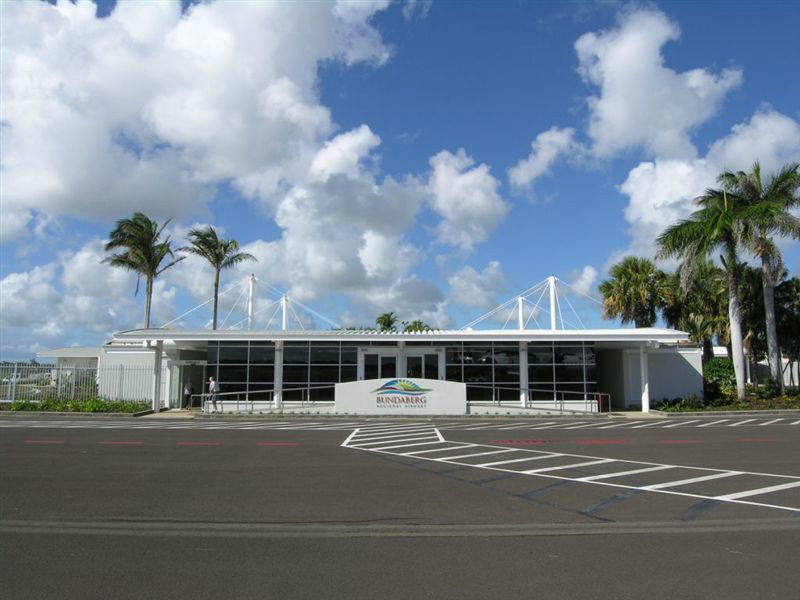 Owned and operated by the Bundaberg Regional Council, major works were conducted in 2009 - 2010 which included extensive work on the runway, passenger terminal, carpark and navigation aids in an attempt to attract jet services from QantasLink and / or Virgin Australia. At present, QantasLink and Virgin Australia Regional Airlines (VARA) provide RPT services from Brisbane with de Havilland Dash 8-Q300 / Q400 and ATR 72-500 / 600 aircraft respectively while Seair Pacific operates regular transfers to Lady Elliot Island with Cessna 208 Caravan's and Britten Norman Islander's. The main asphalt runway is aligned 14/32 with a length of 2000m (6562ft) while the second grass/clay surfaced runway aligned 07/25 has a length of 1128m (3701ft). Bundaberg Airport is home for light aircraft manufactuer, Jabiru Aircraft and avionics specialists, Microair Avionics. The Bundaberg Aero Club and Hinkler Flying School are community based organisations for those who love to fly or have an interest to learn to fly and until recently (Jan '16), general air charter including aerial photography, scenic flights, surveys or surveillance were provided by Cromair whom have now (unfortunately) relocated to the Gold Coast. Additionally, the Royal Flying Doctor Service (RFDS) and RACQ CareFlight Rescue each operate from a shared hangar. During World War II, RAAF Station Bundaberg was established at Bundaberg Airport and operated primarily as a flying training school from October 1941 - July 1947. To further enhance the local aviation industry and located within the Botanic Gardens of Bundaberg, the Hinkler Hall of Aviation relives the days of aviation icon, Bert Hinkler, and is a must see for any aviation enthusiast.